Taking Doctor's Best SAM-e has helped keep my energy levels up. 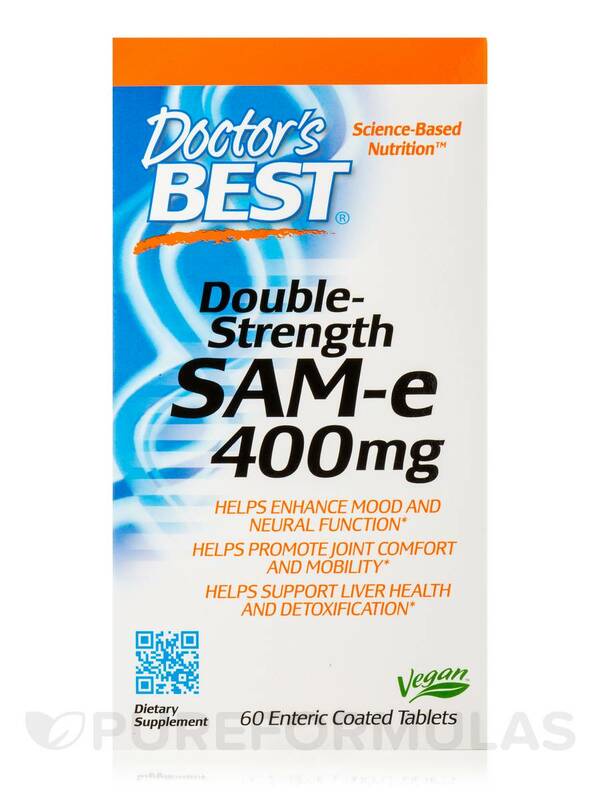 Doctor’s Best SAM-e is proven to enhance mood and promote cognitive health. It is essential for the healthy metabolism of the major brain transmitters’ dopamine‚ serotonin and norepinephrine. 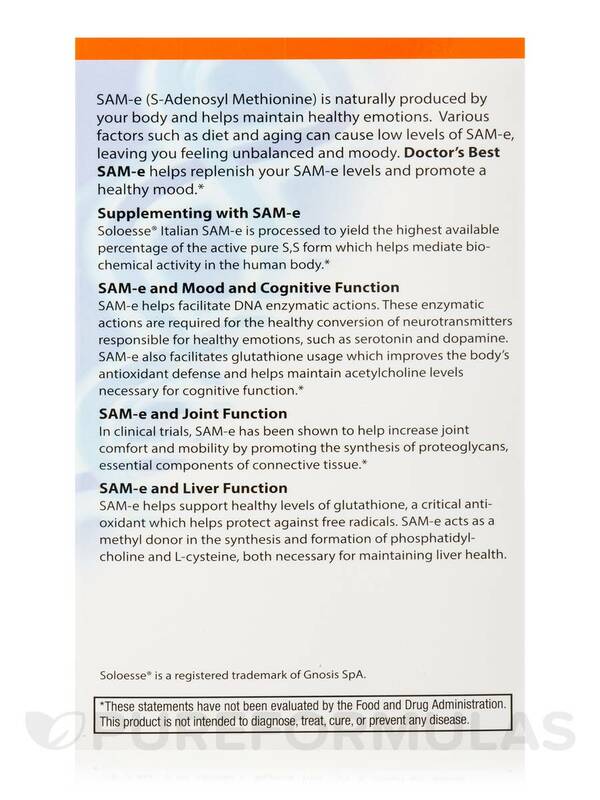 In addition‚ SAM-e promotes joint comfort and mobility and supports liver health and detoxification. SAM-e effectiveness has been published in 18 controlled human trials published over 40 years. 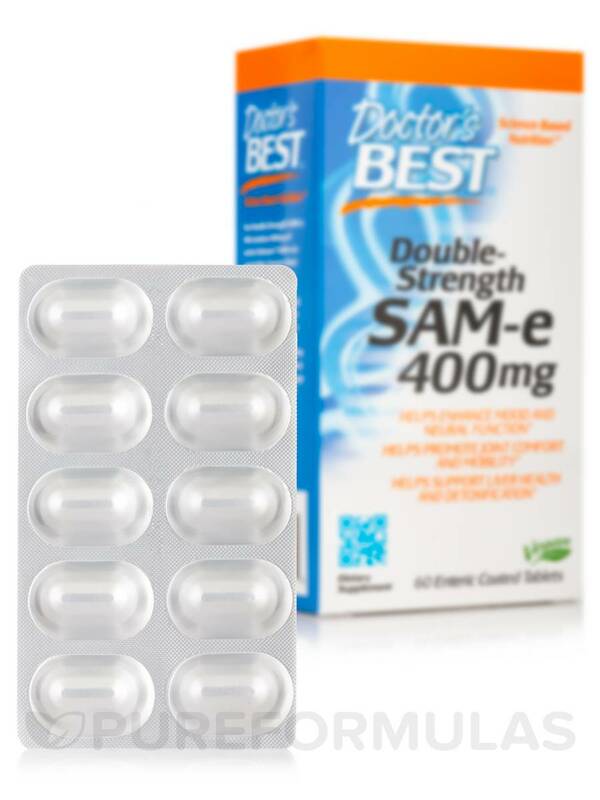 Doctor’s Best SAM-e uses pharmaceutical grade materials. SAM-e is derived from the amino acid methionine and is one of the most important methyl donors in the central nervous system. SAM-e optimized for potency‚ stability‚ and to survive the stomach acid and reach the intestine (where it is absorbed). Effectiveness of SAM-e has been backed by at least 18 controlled human trials published over almost four decades. Other Ingredients: Microcrystalline cellulose‚ magnesium hydroxide‚ stearic acid‚ calcium chloride anhydrous‚ magnesium stearate‚ colloidal silica anhydrous‚ calcium oxide‚ magnesium silicate‚ natural food glaze‚ arginine base‚ glycerol‚ sodium alginate. Gluten-Free / Soy-Free / Vegan / Vegetarian. 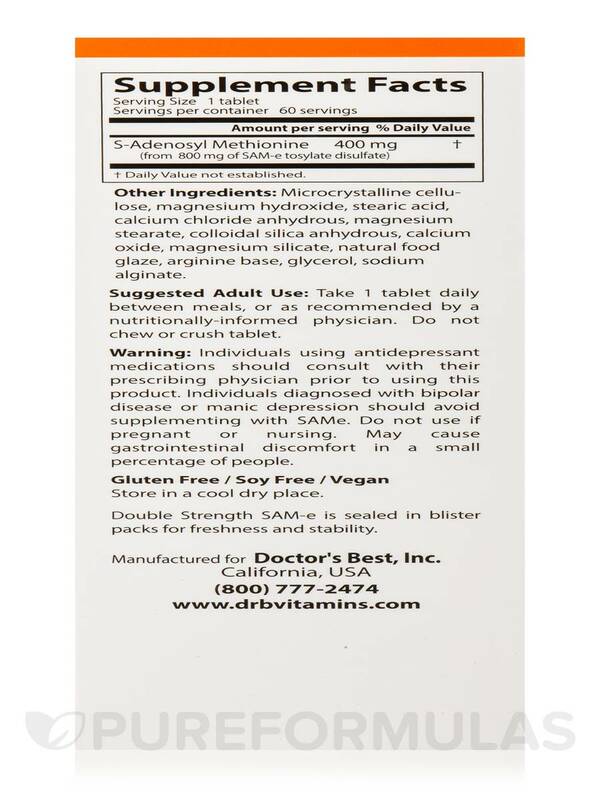 Take 1 tablet daily between meals‚ or as recommended by a nutritionally informed physician. Individuals using antidepressant medications should consult with their prescribing physician prior to using this product. Individuals diagnosed with bipolar disease or manic depression should avid supplementing with SAMe. Notice: May cause gastrointestinal discomfort in a small percentage of people. Adult child has anxiety and panic attacks. 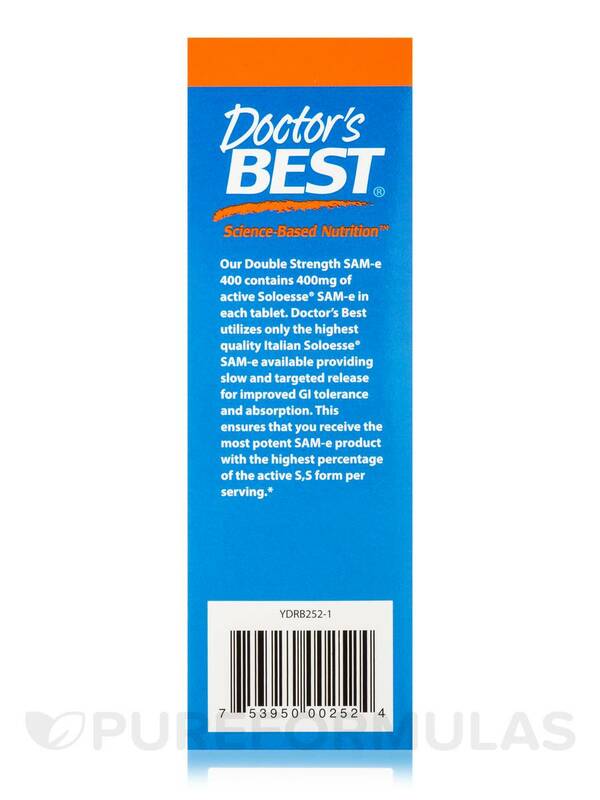 SAM-e by Doctor's Best has been helpful. 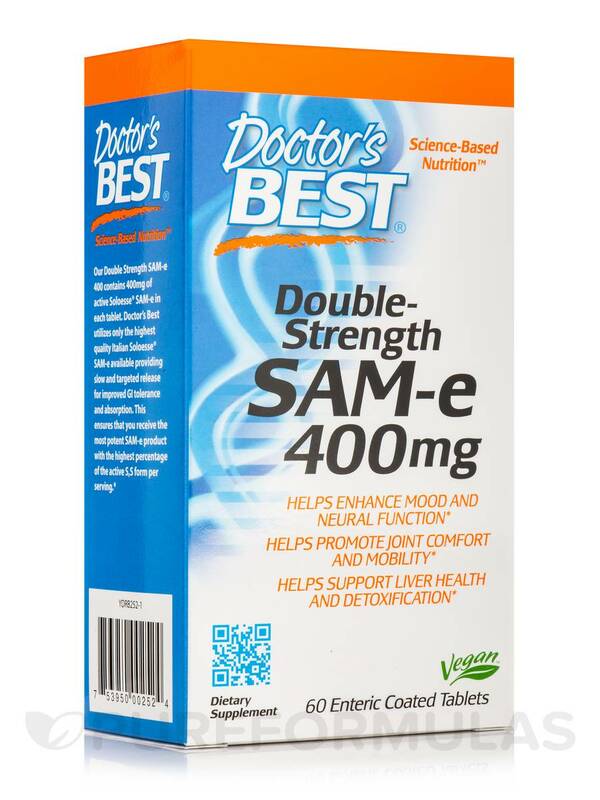 I enjoy taking SAM-e by Doctor's Best and I love the way it helps me! The way it makes me feel! 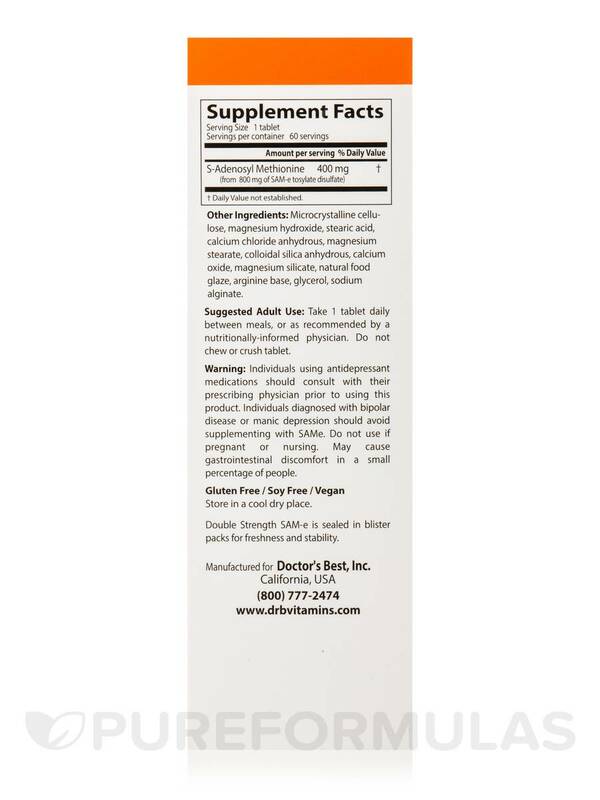 I take 800 mg. in the morning for mood support along with Gaia Herbs St. John's Wort. I did not notice a difference when taking only 1 pill (i.e. 400 mg) a day but I got mood improvement from taking 2 pills. Like how the pills are packaged. Expensive and the list of additives are unrecognizable ingredients are quite long! Wish there was a SAM-e product out there without all the additives. 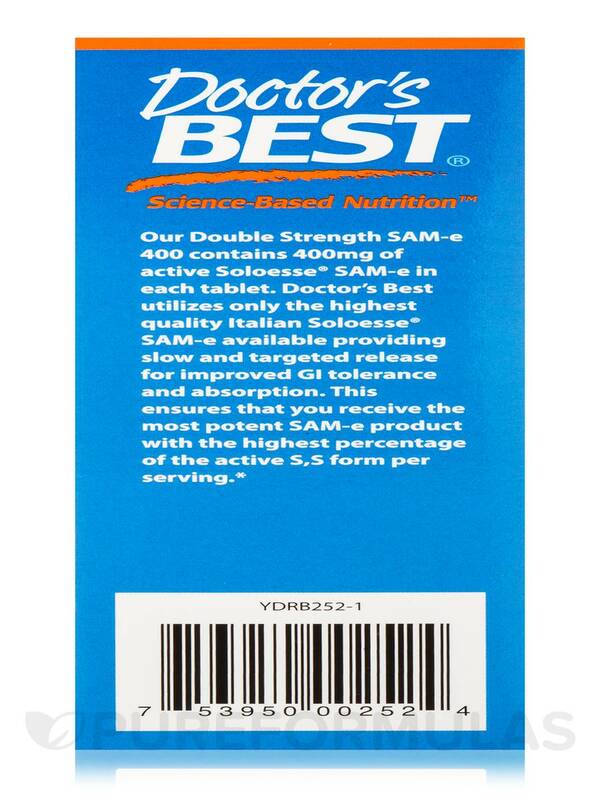 My husband takes the Sam-E by Doctor's Best for liver support, ( prescribed by his Dr) which has been excellent. He also reaps the benefit of it being a mood elevator. It also helps with joint discomfort and better joint function. He has had a very good experience with it. Just remeber, if you tend to be bi-polar, this is NOT for you!! 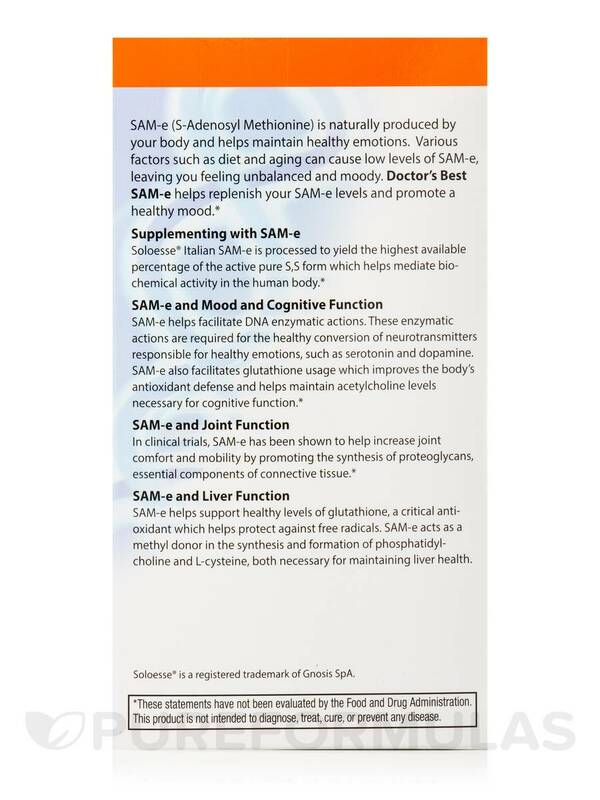 see the warnings about SAM E .
Excellent value and wonderful product. 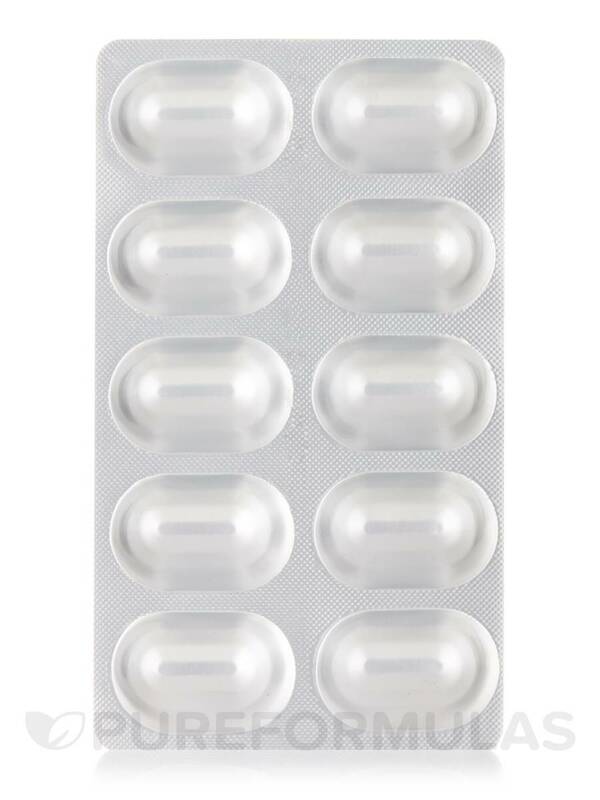 Tablets are individually packaged. This makes it easy for taking them with you and keeping them fresh. I tried these and unfortunately they didnt work and are very expensive. But obviously with these types of things everyones body chemistry is different. Normailly I dont have any GI issues with supplements and I take quite a few. I have osteoarthritis in my hip and have read that sam-e was fairly effective for osteoarthritis. The directions take away from food has to be one of the worst written instructions on a supplement. What does that mean? An hour after eating an hour before eating 2 hours 3 hours? I took it several hours after lunch for the first time. Major stomach ache. I re-read the box and noticed: May cause GI discomfort in a small percentage of people. I think they need to put that in BOLD. After reading reviews of sam-e and the GI problems that many people had I read that the best time to take it was first thing in the morning with a full glass of water. They should think about including that in the instructions. That worked for the stomach ache. Not sure what to do about the GI issues like loose stools. Ive taken it for about 5 days and Im debating whether to continue as I have not seen any benefit worth the discomfort and cost. It also seems to have the effect (like too much coffee) of feeling jittery. I was worried that it might keep me from sleeping but that didnt prove to be an issue. SAM-e works a lot better than regular SAM E from Doctors best. Double strength is much more effective. SAM-e has great quality and Ive tried others but like this one the best. SAM-e helps me think clearer and keep my thoughts. Others have reported that they get anxious or experience insomnia but I have not experienced any of that. I am taking SAM-e under the consult of my doctor.